Because my work is one-of-a-kind, pieces shown are merely a representative sample and may have already been sold. This series is the one focused on my love of textiles. I literally take a textile structure and translate it into metal. In one case, I use a lengthy and tedious process of repeatedly bending and folding fine silver or copper sheets until they look like a piece of draped material. 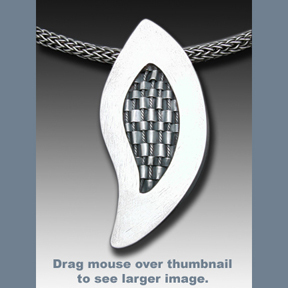 In another case, I weave fine silver and other metal wires or polymer clay strips embossed with metal foils into"yardage". Or lastly, I etch or (roller) press patterns onto assorted metals and essentially patchwork these patterns together with solder (rather than thread). In all cases, I cut the metal textile into a desired shape and incorporate it with sterling and other metal sheet, wire, tubing, and occasionally semi-precious accent stones or pearls, to form a wearable art object.